Originally posted via website on Feb 13, 1997 to NCTM. This web version first created Feb 27, 1997, HTML formatting, pictures and hyperlinks added, text unchanged -- except for a fixed typo or two (including changing NCMT to NCTM) -- from the original. Pictures by Richard Hawkins and Chris Fearnley. "2. What are new issues that should be addressed in an updated version of the Standards? Click to reply." Kirby Urner is a former high school math teacher and math curriculum text book consultant for McGraw-Hill, now writing public domain curriculum material for the World Wide Web in collaboration with many talented individuals. He is an award-winning explorer in the new field of synergetic geometry, author of Synergetics in the 1990s (published journal), and former webmaster for the Buckminster Fuller Institute (BFI). He holds a BA from Princeton University. How to best package mathematics, including geometry, most efficiently and accessibly, is one of those open questions which retrieves different answers with the times. I was the target of 'new math', heavy on the set theory. Although there's been considerable backlash, in my case that curriculum was right on. My parents, like many, maybe thought propositional calculus (so-called truth tables), Venn diagrams, and the unions and intersections of sets was way too abstract and newfangled to have much relevance to my future. But here I sit, writing in 'standard query language' (SQL) against sets of records, devising inner joins to retrieve their intersections, filtering by boolean-style propositions. I'm not claiming 'new math' was right for everyone, but I think the curriculum heads were brainstorming in the right direction for a lot of us. But in 10th grade, no one explained to me that the tetrahedron inscribed in a cube has 1/3rd its volume, that the leftover scraps of cube assemble into a half-octahedron of volume 2/3rds. By shifting 'unity duty' onto the tetrahedron's shoulders [sic] for a change, we get a cube of volume 3, an octahedron of volume 4. And a rhombic dodecahedron of volume 6, space-filling to define unit-volumed couplers and packed-sphere domains, dissolving into a lattice of complementary tetrahedral and octahedral voids, the ones we've already met, of volumes 1 and 4. No one introduced me to the spin-networks generated by axially spinning these shapes, nor to the smooth transformation between the octahedron and cuboctahedron, passing through a five-fold phase along the way, picking up the icosa (and its dual), and its spin-network as well. Superimpose the VE's 25 great circles and the icosa's 31 to get LCD triangles incorporating both 4- and 5-fold angles, a common denominator for both symmetry groups. Personally, I also like the economy of a rhombic triacontahedron with a diameter just a hairline shy of its dodecahedral containment, with a volume of 5 on the nose, its T-mods equivolumed with the As and Bs -- leaving the door wide open to your own phi-scaled modularizations. In just three paragraphs I've covered a lot of geometry, and it wasn't hard to grasp -- none of it was beyond a 10th grader's level of literacy. With a few high powered animations and some hands-on model making, kids would have all this stowed away in no time. With this basic toolkit absorbed, it's easier to navigate in the structured worlds of virology, chemistry, crystallography, even cartography. A lot more of the curriculum finds a foothold, once the concentric hierarchy is firmly anchored. The chemistry teacher down the hall will have a much easier time discussing the allotropes of carbon with students already so well prepared. 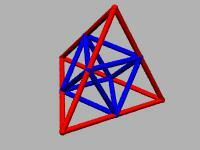 When you intersect a regular tet with its dual, inscribing both in the duo-tet cube, you get an internal octahedron as common to both, with four 1/8th tets protruding, each through the other's faces. That common octahedron is 1/2 either tet's volume, the protrusions (4*1/8) giving the other half of a tetrahedron's total (tet=1). The octa's edges are 1/2 those of the tet, so to elongate all of its edges by a factor of two is to increase its volume 8-fold (power rule) i.e. is to obtain a volume of 8*1/2=4. Diagonals of a parallelogram bisect each other (relevant to Step 5). Which of the following are true about the volumes in this scenario? Write a 4D Logo program to draw T1 and T2 inscribed in C1, using different pen colors for each.